My 87 year old black dad is a baby conservative. After several years of me printing out my articles and mailing them to him, Dad finally realized his loyalty to Democrats was not only misguided, but was actually destructive to blacks. Thus, I have become Dad's Conservatism coach. He phoned me with a chuckle in his voice, "What do you think about Donald Trump?" Dad was referring to Trump's comment about restricting Muslims from entering our country for awhile. Despite my efforts to guide him to conservative media, Dad still gets his news from the MSM; a fan of Don Lemon at CNN. Consequently, Dad has been taught by the MSM that all opposition to Leftists implementing their liberal socialist/progressive agenda is racism or hate. While on the stepping machine at the gym, one of the TVs was on CNN. CNN featured numerous panel discussions purposed to portray Trump as a racist ignorant SOB for suggesting a temporary ban on Muslims entering our country. The truth is there is historical precedent for Trump's proposal. http://bit.ly/1ORtyKT It is a common sense precaution to protect Americans. Still, the MSM foolishly hoped Trump's Muslim ban proposal would be the final nail in his presidential hopeful coffin. I offered Dad a parable. Imagine that you were starving. A gruff burly un-bathed biker comes along and gives you food. You would ignore the biker's rough-edges and foul odor, right? Dad said, "Yes, I would say praise the Lord." I said, "Dad, the American people are starving for a renewal of America's greatness." I recited a list of Obama's lies and anti-American policies. I informed Dad to how voters have been betrayed by Republicans, reneging on their vow to push back against Obama's lawless implementation of his socialist/progressive agenda. So along comes Donald Trump promising starving Americans a feast of renewed American greatness. Starving excited voters with forks in hand ready to eat, crossing all demographics, have taken a seat at Trump's table. I explained to Dad that Ted Cruz is Donald Trump without the slightly unpleasant smell. Please do not get me wrong folks. I am not dissing Trump. I am merely interjecting a bit of humor. I would enthusiastically give Trump my vote if he became the GOP presidential nominee. 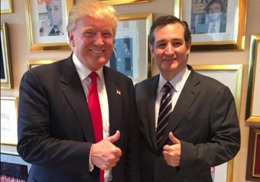 All I am saying is Ted Cruz is a true conservative who offers all the boldness, fearlessness and promises of Trump but with presidential gravitas and moral authority. Confronting the arrogance of Obama's AG Loretta Lynch, Cruz has once again proven he will take no prisoners when standing up for liberty and the American people. In a nutshell, despite the most recent Islamic terrorist attack in San Bernardino in which 14 Americans were murdered, Lynch has decreed that she will throw anyone in jail who dares to speak badly about Muslims. Well, my man Ted Cruz immediately jumped into Lynch's case. Cruz scolded Lynch and Obama. "We see Loretta Lynch, the attorney general, promising in the wake of this terrorist attack – does she come out and say, 'We're going to track down the terrorists and kill them'? Well, let me tell you right now, radical Islamic terrorism is evil." Then Cruz jumped into Obama's case – addressing his absurd arrogant accusation. "Mr. President, there is not a moral equivalence between radical Islamic terrorists and Christians and Jews. Folks, if that doesn't get your blood going and have you standing up and cheering, nothing will. Cruz's rant was bold, and yet, dignified, morally straight and presidential. Donald Trump is Mr Right Now. Sen Ted Cruz is the real-deal Mr Right; prayerfully our next Mr President.